I wanted to share these powerful, true stories of mission work from third world countries. 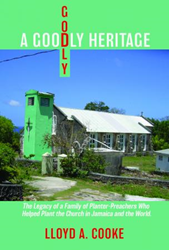 Those who are interested in mission work, especially in third world countries, will find the true stories within Lloyd Cooke’s new book, A GOODLY HERITAGE, ($25.49, paperback, 9781545610411; $9.99, e-book, 9781545610428) completely captivating. Discover how one family of plantation owners were able to produce six generations of cross-cultural and home missionaries. Lloyd Cooke is the son of a minister, who grew up hearing stories of Jamaican missionaries who traveled to Nigeria and Sierra Leone. After attending Bible College, Cooke became a missionary in Dominica and later led a training program for Caribbean missionaries. Xulon Press, a division of Salem Media Group, is the world’s largest Christian self-publisher, with more than 12,000 titles published to date. Retailers may order A GOODLY HERITAGE through Ingram Book Company and/or Spring Arbor Book Distributors. The book is available online through xulonpress.com/bookstore, amazon.com, and barnesandnoble.com.